Insatiable consumers of Internet content, rejoice—developer Marco Arment has released “the biggest update ever” for Instapaper, his Web service and iOS app for saving content to read later, right in time for the iPad 2’s release. The biggest addition to Instapaper 3.0 is a new social layer, but don’t worry—you won’t have to start tweeting and posting and liking if you don’t want to. But if you are the type to share your favorite articles, both Instapaper’s site and apps now offer full-featured integration for Facebook, Twitter, Tumblr, Pinboard, and Evernote. If you’re offline, you can create your posts for those networks and Instapaper will queue them to send when you regain a connection. Now that it’s easier to share articles you like from Instapaper, it’s also become easier to find more articles to read from people you know. A new follower system lets you add friends from networks like Facebook and Twitter and follow the articles they mark as “liked.” This means the “star” system has been replaced by a more broadly adopted “like” button. In addition to sharing liked articles with your Instapaper friends, you can also tell Instapaper to auto-post your liked articles to any combination of your social profiles—but again, only if you want to. Arment didn’t just get touchy feely for this update. The Instapaper apps are now much faster when downloading and opening articles, and they support downloading higher-resolution images. They also now allow for searching the contents of all downloaded articles, and Arment is looking into enabling the ability to search inside your articles archived online as well. Instapaper’s Share panel now lets you create a task in Things, and there are plenty of other useful tweaks and additions for everyone. 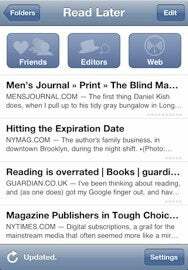 Instapaper 3.0 is available now as a universal app for iPhone, iPod touch, and iPad for $5. It’s a free update to existing owners, and you’ll need to be running iOS 3.1 or later.